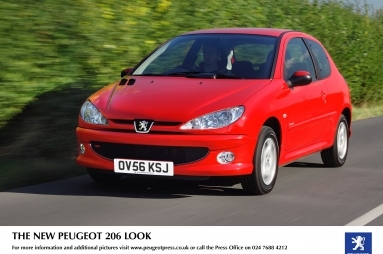 Peugeot’s best-ever selling model, the stylish 206, is now offered as a single model range – the Peugeot 206 Look. With over 600,000 206s already sold in the UK and 5.4 million examples world wide, Peugeot plans to build further upon this outstanding success with a new single-model 206 hatchback range called the Peugeot 206 Look. This new range will replace the previous Urban, Verve and Sport models and fit into the Peugeot range between the Peugeot 107 and the new Peugeot 207. With a starting price of only £8,495 on the road for the 206 Look 1.4 3 door petrol model, the new 206 Look starts at only £100 more than the outgoing 206 Urban model, yet it comes with a much richer standard specification. The new Peugeot 206 Look sees the standard fitment, over the 206 Urban, of 60/40 split rear seat, front fog lights, body coloured door handles, silver grey instrument dials, sport front bumper, body coloured bumpers, body coloured side rubbing strips and a chrome exhaust pipe. The 206 Look goes on sale in October. The 206 SW and CC models remain unchanged. To obtain pricing & specification information, or high resolution downloadable images, please log onto the Peugeot press website: www.peugeotpress.co.uk (Newspress passwords apply).